If you click on the routes on the map, notes about their history and usage are available. It's Other Timelines week on AOA, in which we'll be looking at alternate histories of this place, about big and small things that did or did not happen. It's 2017. As the Capital Region looks back on the first fifteen years of the 21st century, it can be proud of its transit system -- and the inextricably linked patterns of land use that it has built -- even as the rest of the country debates the merit or even the very concept of public transit. Looking back at the past eight decades, there were a few turning points -- inflection points, one might say -- at which regional leaders made choices that could have resulted in a very different future if another path had been taken. 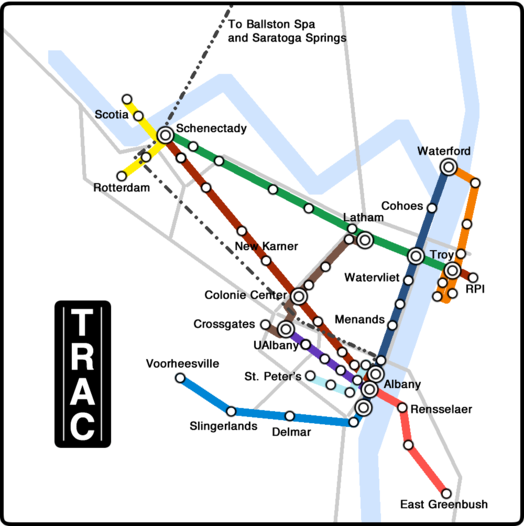 So how did Albany, Schenectady, and Troy end up with a transit system that would be the envy of cities many times their size? If you'd like to review the state of the Capital Region's light rail system, there's a map at the top in large format -- click or scroll all the way up. If you click on the routes on the map, notes about their history and usage are available. All across the country, the Great Depression pushed privately-owned local transit systems into bankruptcy as ridership declined with the economy. In the Capital Region, though, political leaders -- emboldened by the example of Governor Franklin Delano Roosevelt and the modicum of economic stability provided by the expansive presence of state government -- took hold of the chance to spend their way out of the doldrums. Banding together on a regional basis after the governance fashion of the time, Albany, Schenectady, Rensselaer counties and their constituent municipalities entered into what would later be known as a public-private partnership with the local trolley and interurban companies (primarily the Schenectady Railway and United Traction Company but several smaller ones as well) to subsidize ongoing service and infrastructure improvements. As the economy revved up with the outbreak of World War II and local manufacturers such as Alco and GE boomed with demand for military equipment, the infrastructure upgrades provided by public funds proved robust and popular -- and a distinct counterpoint to the wartime shortages of gas and rubber for tires. It was a lesson the local public consciousness would not forget. Ultimately, the entire unified system was brought under public control and parts of Saratoga County were included as well. Across the United States, lack of money for urban investment was not a challenge in the postwar years. Indeed, in many places the over abundance of cash was the problem, as cities exuberantly tore their own hearts out to accommodate the automobile. In the Capital Region, though, things were different. The O'Connell/Corning machine that ran Albany was well known for not taking federal urban renewal funds so as not to invite oversight from a higher branch of government, and thus rejected highways running through the city. At the same time, though, the machine cannily leveraged Governor Nelson Rockefeller's interest in building what would become the Empire State Plaza to extract massive state investment in the region's transit system, whose public ownership was beginning to experience revenue loss and skimp on maintenance, much less expansion. While the Empire State Plaza did level much of downtown Albany, the newly modernized system -- one that would now be more properly referred to as light rail rather than the antiquated "trolleys" -- allowed state workers to commute by train instead of car, thus saving many acres that otherwise would have fallen to what would have been known as the South Mall Arterial. While few builders were still creating quality trolley equipment in the immediate postwar years, the Capital District Transportation Authority partnered with Alco and GE to create modern vehicles, capitalizing on both companies' expertise in railroad equipment. In return for a discounted sale price, the Alco-GE partnership got to use the system as a product testing ground. CDTA has also worked together with local railroads -- especially the "hometown" Delaware & Hudson -- to utilize under-appreciated rights of way such as the "passenger main" to Voorheesville for its services. While the Capital Region has experienced the demand for suburbanization as much as any other, the robust rail- and bus-based transit system has allowed it to channel that growth in a way that reduces car usage and sprawl relative to most of the rest of the country. Early on, the region placed control of land use in the hands of a regional commission charged with coordinating transportation infrastructure and land use; preserving open space and the region's stunning natural and historical resources; and ensuring mobility for all. As alternative projections of a more autocentric future predicted, Colonie has become the second-largest municipality in the region, surpassing Troy and Schenectady -- surprisingly, not because the populations of the center cities have collapsed but rather because the projected second wave of suburbanization that auto-minded planners warned would happen in Saratoga County villages such as Clifton Park never developed. As alternative projections of a more autocentric future predicted, Colonie has become the second-largest municipality in the region, surpassing Troy and Schenectady -- surprisingly, not because the populations of the center cities have collapsed but rather because the projected second wave of suburbanization that auto-minded planners warned would happen in Saratoga County villages such as Clifton Park never developed. The Hudson River municipalities have developed as essentially one dense corridor from the South End of Albany through Waterford, following New York Route 32 and the light rail line along it. While Colonie has largely developed as car-oriented sprawl -- albeit at a density closer to its early "streetcar suburb" roots than the quasi-Sunbelt ideal of many American suburbs -- dense, mixed-use nodes have built up at key crossroads, including Wolf Road, the crossing of New Karner and Central, and Latham. A long, mile-wide strip of relatively walkable and dense development has accumulated along Central Avenue and its fast, high-capacity transit, with large mixed-use (commercial on lower floors and residential above) buildings lining the main arterial itself. The same is true to a lesser extent along Troy-Schenectady Road. 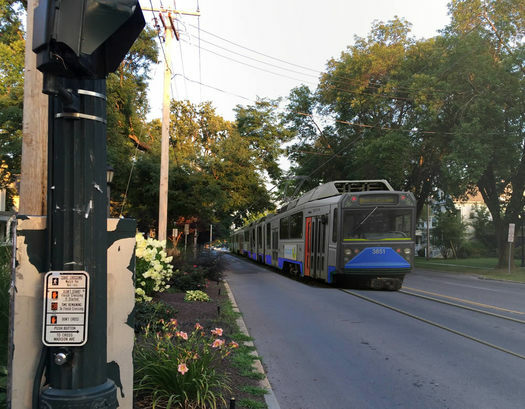 More than anything, it is this ability to channel suburban growth into transit-friendly physical forms that has allowed CDTA's extensive system to thrive. Despite periodic waves of backlash, the grand Capital Region experiment in creating a transit-oriented built environment has generally garnered great praise both locally and nationally. Transit operators, planners, and architects from across the country come to see what the region has done through cooperation, innovation, and willingness to make bold decisions. As 2017 dawns, the system seems mature; but who knows what the future will bring? Sandy Johnston is a transportation planner for the Central Transportation Planning Staff of the Boston Region Metropolitan Planning Organization. Any opinions expressed here are his own. He recently finished his Master's in Regional Planning and a certificate in Urban Policy at UAlbany. He blogs at Itinerant Urbanist and is a vocal presence on Twitter @sandypsj. Before moving to Albany, Sandy had lived in New Jersey, Oregon, Iowa, Connecticut, Chicago, Jerusalem, and New York City. Sandy now lives in the Jamaica Plain neighborhood of Boston with his partner Gabriella and their two cats, but misses the brownstone beauty of Albany's Center Square/Hudson Park. You can reach Sandy with comments or complaints through his website. + What would Albany be like today if the Empire State Plaza had not been built? + Other Timelines drawing: What's a local "what if" question that you'd love to know the answer to? I love it! Two lines would have run right near my house. But to be fair, so do several CDTA bus lines, and I just noticed a new bike-share station two blocks up the street. I use that Cohoes line every day. It's great to be able to get work and read the newspaper at the same time! If only, right? Light rail + streetcars are popping back up all over the United States - I'd love if a system made it here. Nice idea- but while we're in fantasy world, how about our brief flirtation as a Zeppelin transit hub? These articles just make me depressed for what could have been. The map captures how surprisingly well the Capital Region is laid out for light rail. ... The CDTA bus system is good as far as it goes, but I've lived here long enough to recognize the disdain for buses that is deeply ingrained in a large part of the population. A rail system would change the paradigm, and remove the constant pressure for more parking. We need MASS to have mass transit. So long as there is disdain for busses and the people that ride them - see the flap over the "iron gate" bus plus stop, there's never going to be the ridership needed to make the leap from BRT to light rail. Development patters need to change and so, too, do attitudes about transit.